Optical imaging, including bioluminescence (BLI) and fluorescent lifetime imaging (FLI), are two methods of obtaining information on tumor burden and metastatic behaviour. Traditionally these optical images have been combined with CT images in an attempt to provide some anatomical points of reference, however CT provides only limited soft tissue differentiation. In comparison MRI is the gold standard for soft tissue imaging, providing exquisite detail of anatomical structures allowing the 3D optical images to be localized within a specific organ for example. Additionally, the co-registered images would allow the researcher to confirm that a structure identified on the MR image was in fact a tumor based on the localization of the optical signal to the same region. These combined images provide valuable information to be used when assessing tumor growth, as well as the efficacy of a therapeutic approach. 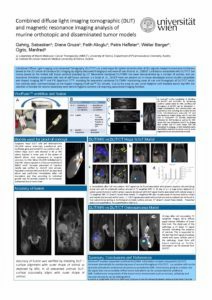 The proprietary animal transport system is compatible with both the M3 and M7 systems, and has been designed to work with the IVIS SpectrumCT® from PerkinElmer. The 3D tomographic optical/CT images are co-registered with the MR image using the VivoQuant software, which is an add-on available for the M-SeriesTM systems.